Embraer Executive Jets president and CEO Marco Túlio Pellegrini (center right) accepts certification papers for his company’s new Legacy 450 “mid-light” business jet from Brazil Agência Nacional de Aviação Civil (ANAC) deputy Dino Ishikura (center left). The pair are flanked by ANAC airworthiness superintendent Mario Igawa (far left) and Embraer vice president of engineering and technology Humberto Pereira (far right). Embraer received type certification for its new “mid-light” Legacy 450 from Brazil’s civil aviation agency, Agência Nacional de Aviação Civil (ANAC), during a ceremony today at the LABACE show. The company also announced that the twinjet has exceeded many of its guaranteed performance specifications. 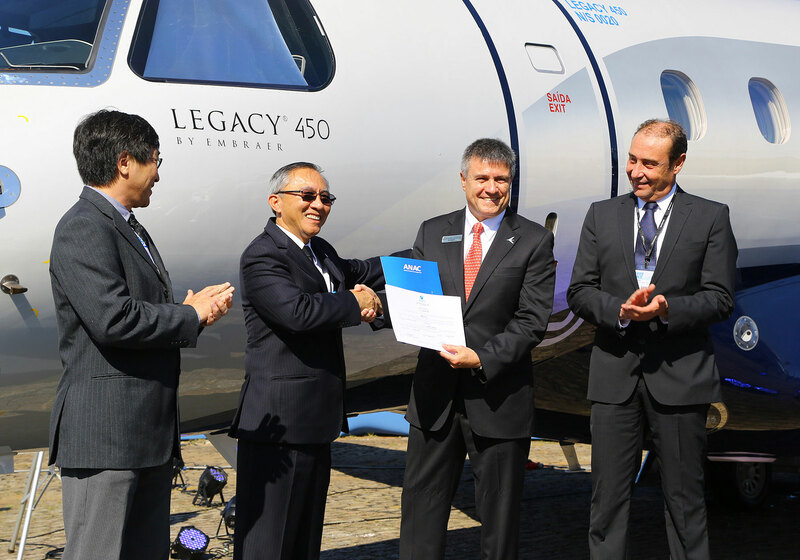 “We are especially thrilled with the Legacy 450 certification, delivering on our commitment to reach this milestone just one year after the Legacy 500,” said Embraer vice president for engineering and technology Humberto Pereira. The two aircraft share 95-percent commonality, Embraer said. Two Legacy 450s participated in the certification effort, the first with flight-test instruments and the second with a production-conforming interior. ANAC deputy director Dino Ishikura said the agency spent a total of 12,000 man-hours to process data and paperwork during the aircraft’s certification effort. Embraer Executive Jets president and CEO Marco Túlio Pellegrini called the Legacy 450 a “game changer in the mid-light segment,” noting that the final version has better range (2,575 nm versus 2,500 nm) and field performance (takeoff distance is 175 feet less, at 3,825 feet, and landing distance is 217 feet shorter, at 2,083 feet). Embraer expects to receive FAA certification for the Legacy 450 in the “coming weeks,” with EASA approval to follow soon thereafter. Production of the Legacy 450 has already begun and the first delivery is scheduled for the fourth quarter.